Champagne as a toner, olive oil as a cleanser - Cherry Colors - Cosmetics Heaven! As promised here's my entry about the natural cleaning products :). Last week I saw a couple of tutorials from MichellePhan on Youtube. So the ideas are not mine. Nope, I normally wouldn't use stuff I drink/eat on my face. But alright now that I know it.. it's damn fun! I started with an aspirin mask that of which I found the 'recipe' on Michelle's youtube too. It was fun! And it really smoothed my skin! And it was so much more clean after that (before that I had a breakout because of some unknown product). So I got my fav champagne (still cheap but it tastes like peaches so it's my fav!) 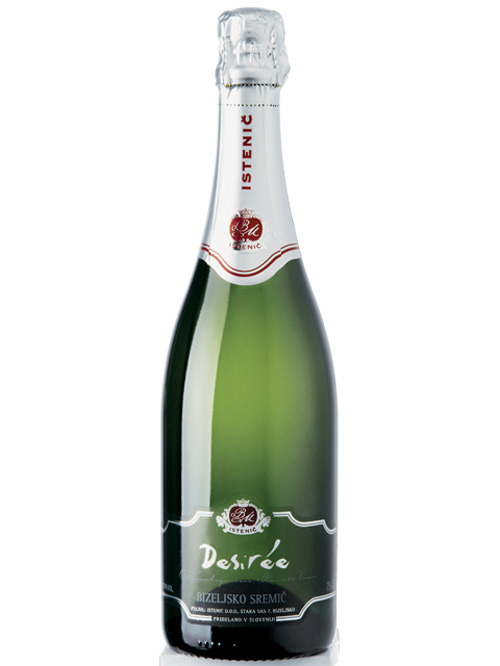 Istenič - Desiree (plus I love the name, especially after reading a book about Napoleon ex fiance Desiree). And at the same time I poked and whined about wanting some olive oil to cook with (yah we went to MB with my bf, and I wanted to cook), but my hidden plan was to use it as a cleanser too! I know, sometimes I'm such a drama queen. After some heavy make up, I decided to give everything a try. I took the olive oil and put some on a cotton pad. I put too much of the olive oil, so after cleaning my skin was really oily. But with a bit of soap and water that wasn't a problem anymore (I didn't have any regular cleaning stuff with me). Then I got a glass of champagne and drank it, just to enjoy the taste... and then applied the champagne on another clean pad (the best is to cover the bottle's neck with the pad and let the champagne soak into it, but just for a second). And ooooh that was a refreshing feel! Honestly it was just so much better than a regular toner. It was amazing! My face felt really clean and fresh, perfect! After all that I applied my regular moisturizing cream. Of which I ran out, yap. That was my cleaning process for the last five days. I didn't have any breakouts, my skin is pretty much ok! But the thing is that the forth day I ran out of champagne. At least the regular one. I still had some red champagne left - Istenič Miha in the fridge, from the NY's eve. But.. that wasn't good. The bubbles were all gone, it smelled funny (like regular wine), the feeling after it was just yuck. I really like it! If I knew that no one would drink it, I'd use it at home too! After it a good daily cream is a must. Just because of the smell. The olive oil worked really well as a facial cleanser. Especially for heavy make up. Like Revlon Color Stay foundation. That one is a real pain to get off! It's like I used a tiny bit of oil to clean my entire face. * I guess it can be used as a moisturizer, because after the cleaning my skin felt really nice. *it's oily, lol *if you put too much of it, you have to get it off, especially if you have oily skin *if you put it on the sun/too hot place it will ruin ._. Olive oil can be used in a skin care regiment in a number of ways. * As a bath oil. Substitute regular bath oil with a couple of tablespoons of olive oil. * As a skin moisturizer. Apply olive oil to dry skin on any body part (face, elbows, feet, etc.) to help the skin regain its natural oil balance. Olive oil can be added to many of the natural facial home recipes that exist. When combined with some sugar, olive oil makes a great hand exfoliant and moisturizer. * As a night cream. When combined with vinegar and water in equal proportions, olive oil will soften and moisturize the skin as you sleep. The vinegar acts to lighten skin discolorations and helps to exfoliate the skin. * Olive oil has antioxidant properties and thus protects the skin from those harmful and damaging free radicals. It is beneficial in slowing the aging signs such as fine lines and wrinkles. * Olive oil can be used as a lip balm, hair moisturizer, nail soak, dandruff treatment, etc. * Some research has indicated that applying olive oil on the skin after being in the sun may help reduce the damage caused by sun exposure. * Other potential benefits of olive oil as an olive oil skin care product include: treatment of - minor skin wounds, eczema, and psoriasis. * The vitamin E in olive oil makes it a great overall skin care product.